Have the Renton Committee’s recommendations on electronic access to legislation been fulfilled? My thanks to John Sheridan of The National Archives, Professor Helen Xanthaki and Jack Simpson-Caird for their comments on this article. All errors remain my own. Public access to legislation has long been regarded as an important element of a good legal system. The original Draconian codes were inscribed on wooden tablets placed throughout Athens so that citizens could read the law. Is online legislation the modern analogue? This article explores the impact that technological advances have had on electronic access to legislation. ‘Access’ has a broad span of meaning. At a basic level it means simply that a law is available to be read. At an advanced level, it means that there is no barrier to a citizen fully understanding the meaning of a law. In this article I take the intermediate path, access means that people can find the legislation, navigate around it and locate provisions that are relevant to their needs. 5. Why is access to legislation important? 6.6 A fully electronic system? Nearly 40 years ago, Sir David Renton produced the highly influential Report on the Preparation of Legislation. (1) Reconsideration of the Renton Report is timely as it was cited in Parliament’s most recent report on quality in legislation. (2) In fact, the editorial of the most recent edition of the Statute Law Review is entitled ‘Renton Rides Again’. (3) The Renton Report was concerned with improving the quality of legislation generally. Although its technological horizons were limited by the capabilities of the 1970s, its principles about what users need are relatively unchanged in the modern era. The Renton Report made recommendations on improving access to legislation. The main question which this article seeks to answer is, to what extent have those recommendations been fulfilled? Section 2 of this article describes the Renton Report recommendations for electronic access to legislation. Section 3 examines some of the difficulties with providing access, both in terms of cost, and difficulties arising from the nature of legislation itself. Section 4 examines how technological developments can be of assistance. Section 5 spells out why access is important. Section 6 develops the Renton recommendations and derives five functions which an accessible legislation system ought to fulfil. Section 7 assesses The National Archives legislation website at www.legislation.gov.uk by reference to these five functions. Section 8 concludes by suggesting some ways in which the provision of electronic access to legislation can be improved. Chapter XVI of the Renton Report is entitled ‘how computers would help’. Its main focus is on how IT could help the legislative drafter in preparing legislation. The legislative drafter (also known as parliamentary or legislative counsel) is the government lawyer who actually writes the legislation – taking the sometimes inchoate policy from the Minister / Department and turning it into legislation fit for the statute book. Although most of the recommendations are targeted at the drafter, they also benefit the end user of statutes. This section discusses all of the Renton recommendations set out in Chapter XVI, but the main focus is on those which would assist in electronic access to legislation. The first heading considered by Renton is information retrieval. Renton concludes that it would be useful for users to be able to search for a particular word or word string in legislation. In the modern era, it is difficult to comprehend the awfulness of the alternative ‘for the draftsman to read all the statutes or rely on his memory’. (4) Bing relates how in the US in the 1950s there was a proposal to amend the law by changing the term ‘retarded child’ to ‘exceptional child’. (5) Tracking down all legislative references to ‘retarded child’ would be a time consuming and tedious task. Bing describes how Horty created a text retrieval system to automate this process. Renton’s third heading was current and historical files. What he meant was that although a file setting out the law as originally enacted would be useful, this would not on its own be sufficient. In discussing access to legislation provided by BAILII, Leith observes that BAILII only sets out the law as enacted, not as amended. (7) It can be dangerous to rely upon a version of a statute which may have been superseded. The best solution is to record how the law stood at each time that it was amended. Renton considered that there would be storage issues connected with maintaining and storing historical versions of files, but that these difficulties would not be insurmountable. He also recognised one difficulty with starting any electronic legislative database – how to read, process and store old legislation which may not be in a machine readable format. Migration of existing data onto a new system is always problematic. Renton’s fifth heading was on using IT as an analytical aid. This was seen as a way of using a computer to check if the logic of a statute was correct. In theory, the legislation could be turned into a programming language and processed by a computer to see if its logic was ‘true’. For Renton this idea was very much in embryonic form, but in section 4 recent developments in this field are analysed. Renton’s sixth heading was on printing. His recommendation was for a simple unified system so that the law on the drafter’s screen would be sent to Parliament and thence to the printers seamlessly, without the need for any retyping or reformatting. Although Renton was very prescient, there are two related developments which he could not have predicted from the 1970s. The first is that the rise of the internet has meant that much more information generally is available to citizens, and that law is no exception. This has led to a democratization of access to legislation – everyone expects to be able to access law, it is no longer the sole preserve of lawyers. The related development is search engines. Baldly put, if legislation is to be accessible online, it must be configured for search engine optimization. Most of Renton’s recommendations are encapsulated in the Court of Appeal’s complaint in R v Chambers ‘there is no comprehensive statute law database with hyperlinks which would enable an intelligent person, by using a search engine, to find out all the legislation on a particular topic’. (10) In section 6, I take Renton’s recommendations and use them to derive five functions which a legislation system ought to satisfy. Two difficulties with providing access to legislation are the cost of legislation systems and structural difficulties relating to the nature of legislation itself. As this article is concerned with publication by government, copyright problems in reproducing legislation are not discussed. Hicks gave a presentation designed to assist drafting offices from around the world with purchasing legislation systems. (11) The most basic system would cost between $60,000 and $120,000 and would not include a website. In his view, a system which included a website and a way of updating legislation on that website would cost between $120,000 and $3,000,000. In Northern Ireland, the tender documentation for a system for drafting, printing and amending primary legislation suggested a contract price of £410,000. (12) It is possible to have a cheaper system. According to Marsh-Smith, the Isle of Man is currently developing a system with a target budget of £60,000. (13) Anecdotally, it has been suggested that Legifrance (the French legislation website) is better than its UK equivalent because it has ten times the budget. Although costs of up to $3million may seem large, they are small in terms of government expenditure generally (this obviously doesn’t apply to charities like BAILII who provide this service on a tiny budget). Costs can also be brought down by using non-governmental resources. For example The National Archives has an Expert Participation Program. Some editorial work on the website is carried out by unpaid external experts. These experts get valuable insight into how legislation is organised and coded which they are then free to use themselves for commercial purposes (although all The National Archives have an open data policy anyway). Cost objections to a new legislation system can be short-sighted. A modern system can provide large financial benefits. The direct financial benefits can quickly recoup the cost of the financial outlay. For example, there can be substantial cost savings if the process for printing legislation is automated. Marsh-Smith estimated that the cost of printing legislation with the new system decreased from £17 per page to 3 pence per page. Then there is the time saving for government lawyers (as well as judges and civil servants) who no longer have to spend long periods of time manually copying and pasting statutes to get at the statement of the law as amended. There are substantial indirect benefits also. Some investors are much more likely to invest in a country if they can see its laws. The World Bank measures how open a country is to business. (14) One criterion is that regulations are transparent, which it defines as regulations that are clear and accessible to anyone who needs to use them. (15) A jurisdiction may have fantastic intellectual property laws for example, but if no one can read them, no-one will register IP rights there. Some of the characteristics of legislation make it more difficult to access. Legislation needn’t be voluminous, but the modern practice tends towards verbosity. Dhavan argued that part of the problem was a prolific Parliament producing too many laws. (16) Margaret Thatcher stated that the opportunities for judges criticising prolix legislation were ‘increasingly rare’ due to the fulfilment of Renton’s recommendations. (17) Regrettably this has turned out to be a Panglossian prediction. The 2011 annual volumes of UK primary legislation run to 2,789 pages. The 2008 volumes of secondary legislation run to 10,818 pages. The House of Commons Library prepared a briefing note entitled ‘Acts and Statutory Instruments: the Volume of UK legislation 1950 to 2012’. (18) The results from this detailed statistical analysis show that the figures cited above are, if anything, below the average annual page output of the last 10 years. The government’s own drafters agree, citing volume as a cause of complexity in legislation. (19) The vast tidal wave of legislation enacted every year makes it difficult to access the specific legislative provision required. Although legislation may convey information, that is not its primary purpose. As Jenkins said, ‘a Bill’s sole reason for existence is to change the law’. (21) An analogy would be a lay person trying to understand what a computer program does from reading the code. Many of the techniques used to aid understanding are not available in legislation. Bowman, another former First Parliamentary Counsel argues that the legislative drafter ‘works in a stark literary environment and he is denied some of the techniques allowed to other writers’. (22) For example, an important point is only stated once and cannot be repeated. As the current First Parliamentary Counsel put it, we have ‘an intricate web of laws’. (23) An excellent visual representation of this is available online which shows the legal interactions of one statute with other statutes. (24) It is rare to find a statute which exists in a vacuum, un-connected to any other piece of legislation. If a new criminal offence is enacted, it presupposes the existence of a raft of other pieces of legislation. It requires other legislation to set out the powers of arrest for that offence, rules of court indicating the manner in which the offence can be prosecuted, evidential rules on what can be relied upon to prove the offence, sentencing guidelines, prison rules, judicial appointment procedures etc. Accessibility needs to take into account the interconnectedness of legislation. Different commencement dates make it more difficult to meaningfully access legislation. I note here with approval the suggestion contained in clause 49 of the Draft Deregulation Bill. This would allow legislation to be amended so that it states, on its face, the actual date that a law comes into force. So rather than scrabbling around looking for commencement orders, the reader could see straightaway when a provision came into force. Even without devolution, some Acts might apply to England and Wales, others to Scotland or Northern Ireland. With devolved legislatures in Northern Ireland, Scotland and Wales, there is an even greater patchwork of overlapping geographical extent of laws. There is an additional difficulty if laws are being piloted in particular areas. An Ordinance to provide for the establishment of an electronic database of legislation and approval of a website on which the information in the database may be published and accessed; to give legal status to copies of the legislation published on an approved website. The only thing that Parliament passes is the two dimensional page before it. A hypertext link is not part of a statute, it is an editorial addition designed to improve accessibility. Although such editorial additions can be extremely helpful to users, they do not have democratic legitimacy. What happens if a link is wrong? I submit that as Parliament has not assented to the link, it does not form part of the law. In the four decades since the Renton Report, there have been huge technological advances which make some objections grounded upon a lack of technology seem practically antediluvian. Storage, particularly of text files, is now virtually limitless. Based upon personal experience, a medium length statute takes up less than 0.5MB in Word or PDF. A home user could easily store 1,000,000 statutes. The National Archives store a complete copy of the entirety of the statute book for each point in time that legislation is amended. Capacity is no longer a problem when it comes to storing legislation. Networking has made communications between computers much easier. Networking means that everyone on the network should be able to access all networked resources, rather than being limited to resources stored locally on each computer. Furthermore, integrated systems mean that information should only be keyed in once, rather than constantly re-inputted as data moves from one part of the system to another. An integrated system from drafting to publishing was seen as one major benefit by Marsh-Smith in the new Isle of Man system. The internet has vastly increased potential for online access to legislation in force for anyone, anywhere. Libraries are no longer the only location from which legislation can be accessed. Legislation is no longer esoteric information accessible only in special temples of law, now anyone with internet access can read it at their leisure. Text recognition software allows legislation stored in one (usually older) format to be converted into a new format. For older statutes which have never been stored in electronic form, this can be done via Optical Character Recognition. For documents in electronic form, software can be used (with greater or lesser human intervention) to convert them into the newer form. This means that it is technically possible to migrate historic statutes into a new legislation database. Text recognition software helps fulfil a key function of any legislation system- having a comprehensive database of all laws, not just laws made after a new system is installed. Different programming languages and file formats allow greater flexibility and utility. Hicks strongly recommends the use of Extensible Markup Language (XML) for drafting and publishing legislation. This makes it much easier to process the data and use it in different ways. However, it can be less easy for drafters to operate this without specific training. The National Archives use SGML, the ‘parent’ of XML. Marsh-Smith is of the opinion that PDF files also work and are cheaper and require less technical know-how from drafters. PDF files can include useful functionality, such as a table of contents and linking within a file. Information retrieval or text searching is another technological tool enhancing accessibility. At its most basic, it allows users to search for a particular word or phrase in a document. More advanced tools allow for Boolean operators, proximity searches, wildcards etc. One useful tool is to display key words in context. This means that the search report highlights the search term together with the text surrounding it, giving the user a quick indication of whether a particular search result is relevant. Finally, linking or hypertext is a powerful tool to enhance not just accessibility but understanding. Hypertext allows users to quickly and easily jump from one webpage to another, related webpage. Access to the law is a fundamental tenet of our legal system. Fuller sets out what he calls the morality of the law – the values which the legal system should aspire to. (32) His second route to bad law is failure to publicise that law. Cass doesn’t frame his argument for accessibility in terms of moral imperative. For him, it is part of principled predictability. He states that ‘the requirement of principled predictability also implies that, insofar as a legal rule is directed to particular individuals, it is reasonably accessible to those persons’. (33) For Bingham, accessibility is part of the rule of law. (34) At one level, this is a pragmatic point – if a law is accessible it is more likely to be obeyed. Raz puts this slightly differently ‘laws must be capable of being obeyed’ and accessibility is a precondition to this. (35) However, it is more than this, it is also a point on human dignity. Waldron argues that access to legislation respects human autonomy – we credit humans with the power to make rational decisions after taking cognisance of the legal effect of those decisions. (36) We respect that autonomy if we give people the tools to make their decisions, i.e. if we give them access to the law. At another level, proper access to legislation improves Parliamentary scrutiny of that legislation. If legislators know what the current law is, they will be in a better position to understand the import of proposed changes to the law. Fuller, Raz, Bingham, Waldron, Cass (amongst many others) have all talked about the critical importance of access to legislation in general terms. They provide ethical and practical reasons requiring this. The strength of their arguments is evidenced by the fact that there is no debate on ‘whether legislation should be accessible’. It is accepted by all that it should be. Rather the debate is ‘in what way can we provide access to legislation’. Free electronic access to up to date legislation. Access to legislation as soon as possible after enactment. Access to updated legislation (i.e. older Acts as amended by later Acts). My starting point has been Renton’s recommendations on access to legislation. From these, I have derived (and probably extrapolated) five functions which an accessible legislation system must seek to fulfil. Legislation must be placed online as soon as it is made. All that is required for this function is a snapshot of the law as enacted, not how it changes over time. Dilating upon dates, it becomes apparent that there is an important nuance between the date a statute is made and the date it comes into effect. Although it is important for law to be available as soon as it is made, it is even more important for it to be available before it comes into effect. There is a quantitative aspect to availability. If a specific statute or the official legislation website is online but doesn’t appear near the top of search rankings, it is less visible to users. A great website which is little known isn’t truly accessible. The system needs to keep all legislation up to date. This means that where new legislation amends old legislation, the old legislation on screen should fully reflect all those amendments. The system needs to tell users what the law is today, as well as what it was when it was enacted. This is the key function of the system. If the system can’t tell the citizen what the law is, it has failed. The system needs to state what the law was at a particular point in time in the past. There will be many situations when past legal rights and obligations will be relevant. For example, if there is a dispute over historic tax liabilities, citizens will need to know the tax law at the time a particular financial transaction was carried out. These first three functions are relatively concrete and can be clearly and objectively determined. Making the law available is a necessary pre-requisite to making it accessible. Developing Woolf’s and Renton’s suggestions a little further, this function could be satisfied at a number of levels. Firstly, it could mean internal links within a statute to other relevant parts of that statute. For example, if a rule in s. 5 refers to an exception in s. 10, there could be a hypertext link within s. 5 to s. 10. The National Archives and the Office of the Parliamentary Counsel carried out research in 2012 /3013 on how users interacted with The National Archives website. The results have not yet been published, but Bertlin summarised some of them at a recent conference (55) and some of them have been referred to by the Cabinet Office. (56) One finding was that users are not familiar with the structure of legislation, for example division into sections and schedules. Internal links help overcome lack of familiarity with legislative structure. Secondly, there could be external links to other statutes which are relevant to the statute being used. Most obviously, where primary legislation grants a power to make secondary legislation, there could be a link to each statutory instrument made under that power. Also obvious is that where a statute refers to another statute, there could be a link to that other statute. External legislative links are easier to conceive of where there is a direct textual reference to the provisions of another Act. They are much more difficult if there is no textual reference to the other statute but that other statute remains fundamentally relevant. Take the example of section 203 of the Planning Act (NI) 2011. That section provides for the establishment of the Planning Appeals Commission. If the government were to wait until s. 203 comes into force before appointing members, then there would be a long delay before the Commission could hear cases. It might be useful to appoint members in advance, before the section becomes operative. The power to make appointments in advance of an enactment coming into force already exists and is contained in s. 16 of the Interpretation Act (NI) 1954. Therefore, s. 16 of the 1954 Act is relevant to s. 203 of the 2011 Act, even though there is no direct textual reference connecting the two provisions. This requires a certain amount of subjective judgement and is less easy to satisfy automatically. For example, if one legislative provision establishes a new legal entity, is it necessary to link it to every other section setting out the powers of that entity? In addition to the non legislative information suggested by Woolf above, there could also be links to Parliamentary debates, official forms, Departmental guidance, House of Commons Library Briefing Papers on Bills, etc. Occasionally, during a debate on a Bill, a Minister won’t be able to answer a point raised by a legislator and undertakes to answer the point in a letter at a later date. Greenberg points out that although the promise to write will be contained in the Hansard report, the actual letter won’t. He argues that this letter should also be linked, in some way, to the proceedings in Parliament. (58) There is the potential for different levels of access to this information, i.e. some items restricted for internal government use. There are two methods for generating these links. The traditional way is the top-down approach where civil servants think through what they consider relevant to an Act and then create the links. The more innovative (and riskier) way is to use some Big Data concepts and allow links to be influenced by the choices previously made by users. For example, if people who look at the Companies Act 2006 also usually look at the Insolvency Act 1986, then the system could automatically suggest that a reader of one also may find the other useful. Lavery used the word in a legal context a long time ago, considering a lawyer with a legal question, 'somewhere in that vast storehouse of the law is the answer to his problem, but he cannot find it'. (60) For Lavery the problem was the volume of law piling up, making it harder to find the desired nugget of legal information. This requirement is the hardest to satisfy – the user ought to be able to retrieve the legislative answer to their question from the database, even if the user does not know which piece of legislation contains the answer. If we start from the proposition that the user knows which section in which Act contains the answer to the question, it is relatively easy to design a legislation database which can quickly point to that section in that Act. However, the user may not always know the relevant section or indeed the relevant Act. The electronic system needs to facilitate easy access to help find the answer. For example, if the police arrest a child in Northern Ireland and decide not to release the child on bail, where must the child be placed in detention? The answer is contained in Article 39(8) of the Police and Criminal Evidence (NI) Order 1989. For the system to be truly effective, it must be able to display an accurate and up to date version of Article 39(8). But it must also be able to indicate to the user that the answer is contained within Article 39(8). The five functions listed here all have the basic assumption that a human is looking at legislation on the official government website. However, there is the potential for more advanced, computer-assisted methods of interaction. Computers could scan the website for relevant legislative information, process it and present it in a different format away from the website. For example, a business providing company formation services could mine companies legislation for relevant provisions to reproduce on its own expert advice systems. This ability would be enhanced by a logical and coherent addressing mechanism for storing legislation on the official government website. I hesitate before setting this out as function 6 – that a legislative system must be fully machine readable. However, it is likely to become an increasingly important dimension of electronic access to legislation. The European Union has made recommendations on this point in Council Conclusions Inviting the Introduction of the European Legislation Identifier. (61) The problem identified by the EU is a diversity of electronic legislation systems across the EU – ‘this hampers the interoperability between the information systems of national and European institutions’. (62) The solution is the European Legislation Identifier (ELI), a standardised ‘code’ for referring to legislation. It attempts to standardise Uniform Resource Identifiers (URIs) for legislation. URIs are essentially methods of creating addresses for web pages. In principle a sound URI taxonomy, combined with adoption of ELIs, means that both humans and computers will find it easier to access and use online legislation. Presentation by John Sheridan, Head of Legislation Services at The National Archives, 10 June 2013. Interviews with John Sheridan, 6 June 2013 and 31 July 2013. In practice, this means that a copy of legislation as enacted is made available online almost as soon as it is made. For example, the Allocation of Housing and Homelessness (Eligibility) (England) (Amendment) Regulations 2013 No. 1467 were made on 13 June 2013 and laid before Parliament on 14 June 2013. They were available on the website on 14 June 2013. If a statute is very long or typographically complex, it may take longer to appear online. In theory, where an Act takes effect before publication, a user could work out the text of the Act by looking at the version of the Bill before Parliament and manually incorporating any amendments made during the Parliamentary process. This would be a rather involved procedure to carry out for most users. Turning to the quantitative aspect of availability, there is a deliberate policy to push The National Archives website higher up google rankings when legislation is searched for. This means that when someone searches for an Act, the official website is normally near the top of the search results. In the vast majority of cases, function 1 is completely satisfied as legislation is put online extremely quickly after being made. However if legislation comes into force before going online, it seriously undermines the point of a legislation website. Within The National Archives website, if a new law amends an old law, the amendments can either be un-noted, noted or incorporated. If an amendment is un-noted, there is no reference to the amendment on the legislation that has been amended. If an amendment is noted, it means that there is a warning note placed against the old legislation stating that it has been amended by the new legislation. There is also a link to the amending legislation. If the amendment has been incorporated, it means that text of the amendment has been incorporated into the old legislation. Turning next to secondary legislation, the position is not good. Most amendments to secondary legislation are un-noted. However, The National Archives are now starting to do this. In my opinion, The National Archives is good in satisfying the second function for primary legislation. Within 4- 8 weeks of a statute being made, there is at the very least a note to users on which older legislation is affected by it. However, it still requires work from the user to manually check all amendments which have not been incorporated. They will also need to check that 4 previous Orders of the same name have been fully revoked. Obliging the reader to have 5 documents open at a time does make the legislation rather inaccessible. If the government is to rely upon the maxim ‘ignorance of the law is no defence’ it behoves it to present the law in an accessible manner. The National Archives website facilitates point in time analysis of legislation. This applies only to primary legislation. The user can select a particular date and access how the legislation read at that particular date (i.e. reflecting all the amendments in force up to that date). The base date is 1 February 1991, or for Northern Ireland legislation, 1 January 2006. No point in time analysis is available before the base date. So if a user wanted to know how an Act read in 1985, the user would need to look at the Act as of the base date, and then manually go back in time unpicking all the amendments until they reached 1985. The base dates were not randomly chosen. They are related to the publication dates of the Statutes in Force, or in Northern Ireland, the Northern Ireland Statutes Revised. These are hard copy versions of the statutes as amended which were periodically published in the past. The material in these hard copy publications, together with their cumulative supplements was used as the originating text for the online data. In my opinion, The National Archives website does satisfy this function. The only failing is in the temporal scope of the legislation. A UK base date of 1991 is likely to cover most of the time periods that would be of interest to users. It would cover civil claims within the ordinary time limits set out in the Limitation Act 1980, although it may not cover some criminal prosecutions arising out of events from before 1991. The Northern Ireland base date does not go back far enough. For example, an inquiry was set up to investigate institutional abuse of children in Northern Ireland. (73) The temporal remit of the inquiry is from 1922 to 1995, thus requiring an analysis of the legislative provision for child care for the entirety of that period. The National Archives website does not facilitate this analysis. This is perhaps an extreme example, but it is entirely conceivable that there will be both civil and criminal cases relating to facts before 2006, for which there will be no easy way to access what the law was at that point in time. Turning first to internal links. Every statute on The National Archives website contains a table of contents. Each entry in the table of contents contains a hypertext link to the relevant provision. This allows quick access from the table of contents to a particular section (or Chapter, or Part of the statute). If one section refers to another section, that reference does not itself contain a hypertext link. Thus the user must click back to the table of contents and then click forward to the referred to section. There is no indication that a word used in one section is defined in another part of the Act. For example, if a lay person is reading the Children Act 1989 in sequence, they would reach s. 105 before finding the definition of ‘child’ in a section entitled ‘Interpretation’. Following the survey results discussed previously, a lay reader is unlikely to be aware of the concept of interpretation sections and thus would find it difficult to locate the definition. In other parts of The National Archives website, popups do appear if a phrase is moused over, indicating additional information. For example, in the Inquiry into Historical Abuse (Northern Ireland) Act 2013, there is a dotted line under the term ‘OFMDFM’ where it first appears, and when it is moused over, the text ‘Office of the First Minister and deputy First Minister’ appears. Turning secondly to external legislative links. If a section has been amended, there is a link to the legislation which made that amendment. If legislation refers directly to other legislation, there will sometimes be a marginal citation containing a hypertext link to that other legislation, but sometimes not. For example, s. 1 of the Local Government and Housing Act 1989 refers to the House of Commons Disqualification Act 1975. There is a marginal citation which contains a hypertext link to the 1975 Act. However, s. 18 of the Civil Contingencies Act 2004 refers to the Terrorism Act 2000. There is a marginal citation, but that citation does not contain a hypertext link to the 2000 Act. The editorial nature of marginal citations may perhaps explain their variable treatment. If legislation refers to a word defined in the Interpretation Act 1978 or the Interpretation Act (NI) 1954, there is no indication in the legislation that the word is so defined. For example, s. 5(7) of the Serious Crime Act 2007 refers to an ‘officer of Revenue and Customs’. Nothing on the face of the Act gives any further guidance on the meaning of ‘officer of Revenue and Customs’. However, section 5 of the Interpretation Act 1978 states that in any Act, where a word which is listed in Schedule 1 to the 1978 Act appears, that word is to be construed in accordance with Schedule 1. Schedule 1 states that the term ‘officer of Revenue and Customs’ is to have the meaning given in s. 2(1) of the Commissioner for Revenue and Customs Act 2005. Finally, s. 2(1) of the 2005 Act sets out the manner in which the Commissioners can appoint persons to be officers. A fully contextualised system would guide the user through this legislative maze. If there is a connection between legislation and an EU Directive, there is no direct link on the legislation to the Directive. However, there can be a link to it on the Explanatory Note (a link via a link essentially). Welsh legislation is now available in Welsh right next to its English language counterpart. This is in line with a recommendation by Hughes and Davies on the desirability of having legislation in Welsh available online. (74) In addition, by September 2013 it is planned that the architecture of the website will also be available in Welsh. Turning finally to non-legislative external links. Depending upon the date that the legislation was made, The National Archives website links to other resources from the webpage of the legislation. For more recent legislation, there are links to the Explanatory Notes of an Act. There are also references to the various dates that the legislation passed the stages of the legislative process in the legislature. For Westminster legislation there are also some Hansard references to where Parliamentary debates on the legislation can be found. These extra-statutory links are relatively Spartan at the moment. Returning to the inquiry into institutional abuse in Northern Ireland example, the inquiry’s terms of reference were set out in a statement made by the First Minister and deputy First Minister. (75) Although the statement is referred to in the Act, and although it is highly relevant to the work of the inquiry, there is no link to it on The National Archives website, nor is it contained in the explanatory notes to the Act. The National Archives are fully aware of the importance of what Sheridan has termed ‘contextually aware supplementary information’, or information that helps users to find their feet within the system. In my view, the system does not quite fulfil this function. There are insufficient internal and external links. Only an extremely assiduous user would be able to locate all the relevant supplementary information. The National Archives website allows for a basic and an advanced search. The basic search has four search parameters: title of legislation, year, number and type. Type refers to its classification as primary or secondary and what legislature or jurisdiction it emanates from. The advanced search adds additional parameters. The most useful of these is a keyword in context search. This allows the user to search for a specific word or phrase in the body of a statute. For example, if a user was interested in the law of incorporeal hereditaments, they could quickly determine that the term appears in 7 Acts and could click through to the exact appearance in each of those Acts. This search ability is extremely useful. Another useful additional parameter is to search a range of years rather than a specific year. A search can also be done of a selected range of enactments, rather than just one enactment. So a keyword search can be limited to all types of primary legislation. Searches can also be made by reference to geographical extent. So a user interested in what the law of corroboration was as it applies in Scotland could quickly identify the 10 statutes applying in Scotland which include that term. Draft subordinate legislation can also be searched. Where this system falls down is in providing answers where the user doesn’t know the legal term most relevant to the search. A farmer may want to know about the tax treatment of a right of way over a neighbour’s field, but it unlikely to know that this is legally classified as an incorporeal hereditament (a right attaching to land which is not tangible). (76) There is a limited ability to search by subject matter of legislation, but this only applies to subordinate legislation where the subordinate legislation is arranged by reference to the source of its enacting authority. The legislation system in Guernsey is arranged in this fashion and it is the taxonomic principle behind the United States Code (prepared by the Office of the Law Revision Counsel) as well as Halsbury’s Statutes (a commercial publication) in the UK. This function is only satisfied in a very rudimentary way. Geographical extent is a very useful tool, but on its own it does not satisfy findability. Without having an idea of what legislation contains the required answer, or what the relevant keyword is, it is very difficult for the user to retrieve the legislative provision they seek. The National Archives website is compatible with ELI. Considerable resources have been expended into ensuring that URIs used by the site are logical and coherent. Each legislative provision has its own address and a full explanation of the methodology behind these addresses is given on the website. (77) Although this aspect of the website is still developing, there is the potential for additional functionality being provided by this resource. The Renton Report’s recommendations on electronic access to legislation remain as valid today as they were when initially made. In fact, the basic premise that legislation be accessible to those governed by it hasn’t changed since Greek times. From Renton’s recommendations, I have derived 5 functions which good legislation systems should aspire to. Legislation as enacted and as amended should both be available. The system should be able to relate what the law was at a point in time in the past. It must set legislation in the context of other relevant information and it must allow for intelligent searching of the system. Setting up a good legislation system can be expensive, but the benefits do outweigh the costs in the long term. Legislation is enacted for the sole purpose of making law, and it must abide by legal, constitutional, democratic, political and interpretative constraints. This does make the task of fulfilling the five functions much harder. However, as against this, modern technological developments do help a great deal. The internet, cheap data storage, text recognition software and hypertext linking are all highly effective tools for enhancing our systems. The general answer to the question posed is yes, Renton’s recommendations are being fulfilled. It has been shown that function 1 is generally satisfied as law as enacted is made available online very quickly after being made. The only improvement I suggest is that legislation should not come into force until it has been published online, unless there are truly exceptional circumstances. In fact, there should be a near exact correlation between an Act getting Royal Assent and the Act being published. It has been shown that function 2 is partially satisfied as most important legislation is available online in its amended form. There are two obvious improvements that could be made. Firstly, that secondary legislation as well as primary legislation is updated. Secondly that the remaining unamended parts of primary legislation also be updated. Ideally, the effects of all new legislation should be incorporated into the online statute book as soon as the new legislation is made. It has been shown that function 3 is mainly satisfied as legislation can be searched as at a particular point in time. The only suggested improvement is to increase the temporal scope of point in time analysis by moving back the current base date. Function 4 is concerned with linking legislation to further useful contextual information, either internally or externally, legislative or non-legislative. It has been shown that this function is only just beginning to be fulfilled. There is huge potential for further linked material. Findability under function 5 is one of the hardest functions for a system to fulfil. It is difficult to use legislation as the raw source material for a system which allows for intelligent searching of a legal database. One possible improvement is to expand the subject heading classification currently used for subordinate legislation and use it for primary legislation also. 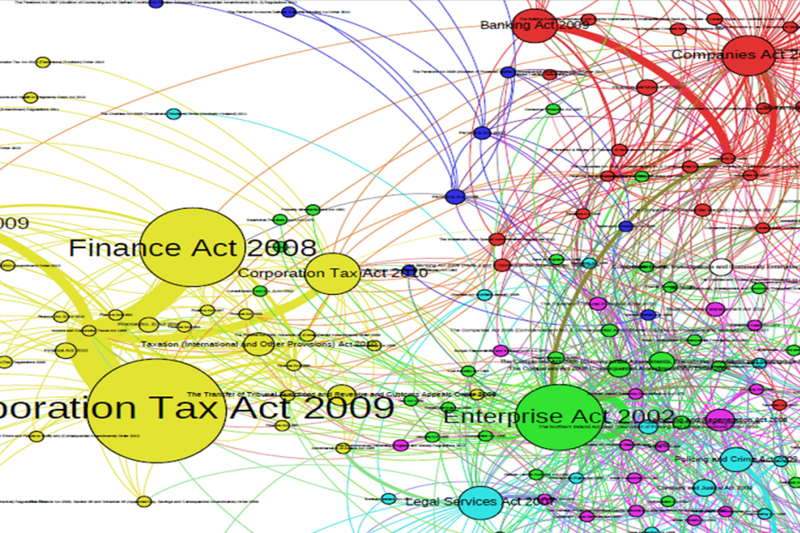 That way, users could see at a glance the titles of all legislation on a particular area. A more fundamental improvement may be to reconceive the art of legislative drafting for the internet era. Heaton suggested drafting in a more self-contained way, as if the user may be looking at links on a website, rather than pages in a book. (78) Unfortunately one person’s ‘self-contained’ provision could be another person’s ‘long-winded’ provision with everything crammed into one section. Another approach could be to use more quotidian language. Most people refer to ‘road tax’ even though there are zero entries for this on the statute book as opposed to 193 entries for ‘vehicle excise duty’. The difficulty is that quotidian phrases may not be legally accurate. A compromise is that drafters can sometimes ‘smuggle’ in the quotidian word to be used alongside the legally accurate word. For example, Article 30 of the draft Bail Bill (NI) makes provision about the legally accurate concept of ‘bail otherwise than at a police station’. However, the police colloquially and on official documents, refer to ‘street bail’. The solution is that Article 30 is entitled ‘street bail’. The heading indicates content to the lay reader, but the full text uses the legally accurate term. One should not be too critical of the system. Legislation is not designed or arranged to promote intelligent searching. The previously discussed difficulties inherent in legislation do militate against information retrieval, particularly for the lay person. It does sometimes require expert assistance. Spence, a practicing doctor talks of the ‘wonderful world of internet misdiagnoses’. (79) If it is dangerous for a lay person to self treat an ailment on the basis of some Googling, perhaps it is also dangerous for a lay person to deal with a legal problem simply by searching through a legislation database. The difference is that human bodies are inherently complex, whereas legislation, as a product of human craft, should at least aspire to being comprehensible by humans. Perhaps this is an apposite time to make a decision about which direction to go. On the one hand, we can retreat into lawyer’s law. This is the idea that law is too complicated, too likely to be misunderstood by citizens, that a little knowledge is a dangerous thing. This direction places legal accuracy and precision on a pedestal, not to be knocked down by demands for accessibility or intelligibility. The other direction is full democratization of law, that everyone can be expected to be their own interpreter of legislation and that law belongs to us all, not merely to a privileged class of lawyers. This direction requires full accessibility of all aspects of legislation, and assumes that given sufficient information, citizens can work out for themselves what law means without an intermediary. Most people will realise of course that this is a false dichotomy. Lawyers and legislative drafters must not fixate upon legal precision to the extent that legislation becomes incomprehensible to citizens. Citizens on the other hand must not assume that they know with certainty what the law is, simply because they have read one particular legislative provision. A law which contains mistakes is a bad law, so too is a law that no-one can access. Legislation must be both accurate and accessible. (2) House of Commons Political and Constitutional Reform Committee, ‘Ensuring Standards in the Quality of Legislation’ (HC 85, May 2013). (5) J Bing, ‘Let there be LITE : a brief history of legal information retrieval’, (2010) 1 European Journal of Law and Technology. (6) F Bennion, ‘The Renton Report’ (1975) 125 New Law Journal 660, 660. (7) P Leith and C Fellows, ‘BAILII, Legal Education and Open Access to Law’ (2013) 4 European Journal of Law and Technology. (9) ‘Ensuring Standards in the Quality of Legislation’ (HC 85, May 2013) Ev 13. (12) Information contained in the Tenders Electronic Daily, Supplement to the Official Journal of the European Union, < http://ted.europa.eu/udl?uri=TED:NOTICE:244968-2011:TEXT:EN:HTML&tabId=1> accessed on 12/6/2013. (13) L Marsh-Smith and G Wright, ‘Information technology on a budget: A giant leap for the Isle of Man’ (Commonwealth Association of Legislative Counsel Conference, Cape Town, April 2013). (14) See World Bank, Doing Business 2013: Smarter regulations for small and medium-sized enterprises 2013 (World Bank and International Finance Corporation, 2013). (16) R Dhavan, ‘Legislative Simplicity and interpretative complexity - a comment on the Renton Committee on ‘the preparation of legislation’ (1976) 5 Anglo-Am L Rev 64. (17) Renton, ‘The Renton Report’s Tenth Birthday’ (1985) SLR 60, 61. (19) Office of the Parliamentary Counsel, When Laws Become Too Complex: A Review into the Causes of Complex Legislation (Cabinet Office, March 2013). (20) Lord Simon, ‘The Renton Report – Ten Years On’ (1985) SLR 133, 135. (21) Sir Christopher Jenkins KCB QC, First Report of the Committee on the Modernisation of the House of Commons, HC 190 (1997-1998). Appendix, paragraph 5. (22) G Bowman, ‘The Art of Legislative Drafting’ (2006) 64 Amicus Curiae 2, 4. (23) When Laws Become Too Complex, 1. (24) < https://assets.digital.cabinet-office.gov.uk/government/uploads/system/uploads/image_data/file/9078/Fig_3_representation_legal_effects.png> accessed on 28 June 2013. (25) Under the Criminal Justice (1996) Order (Commencement No. 1) Order (Northern Ireland) 1997 No. 267. (26) Under the Criminal Justice (1996) Order (Commencement No. 2) Order (Northern Ireland) 1997 No. 523. (27) Under the Criminal Justice (1996) Order (Commencement No. 3) Order (Northern Ireland) 1999 No. 230. (28) F Bennion, Modern Royal Assent Procedure at Westminster (1981) 2 SLR 133. (29) M Bommarito and D Katz, A Mathematical Approach to the Study of the United States Code (2010). (30) H Hodson, ‘AI rules from the bench’ (New Scientist, 18 May 2013). (31) See <http://www.hmrc.gov.uk/calcs/esi-01.htm> accessed 11/6/2013. (33) R Cass, The Rule of Law in America (JHU Press, 2003) 8. (34) T Bingham, The Rule of Law (Penguin, 2011). (35) J Raz, ‘The Rule of Law and its virtue’ in The Authority of Law: Essays on Law and Morality (Oxford University Press, 1979) 213. (36) J Waldron, The Rule of Law and the Measure of Property (Cambridge University Press, 2012). (37) G Greenleaf, ‘The Global development of free access to legal information’ (2010) 1 European Journal of Law and Technology. (38) P Leith, C Fellows, 'BAILII, Legal Education and Open Access to Law', (2013) 4 European Journal of Law and Technology. (39) E Donelan, ‘European Approaches to Improving Access to and Managing the Stock of Legislation’ (2009) 30 Statute Law Review 147. (41) K Anthony, ‘Public Access to legislation project: Served with accompaniments’ (2008) 16 Aust L Libr 21; see also Geoff Lawn, ‘Improving Public Access to Legislation: The New Zealand Experience so far’ (2004) 6 UTS L Rev 49. (43) < http://www.guernseylegalresources.gg/> accessed on 7/6/2013. (44) Law Commission, Post-Legislative Scrutiny (Law Com No 302, 2006) paras 4.11 to 4.15. (47) Office of the Leader of the House of Commons, Post-legislative Scrutiny- The Government’s Approach (Cm 7320, 2008) paras 33-37. (49) House of Commons Political and Constitutional Reform Committee, ‘Ensuring Standards in the Quality of Legislation’ (HC 85, May 2013). (51) HL Deb. February 10, 2003 cc. 464-466, see also the government’s general obligation to publish the statute book, discussed in HC Deb. June 13, 1991 WA 613-614. (52) Fifteenth Report, (11 February 2003), paragraph 4.3. (53) Select Committee on the Constitution, Minutes of Evidence (April, 2004) para 17-18. (54) Lord Woolf, ‘Access to Justice’ Interim Report (June 1995) paragraph 23. (56) When Laws Become too Complex, 19,20. (57) Sir Christopher Jenkins KCB QC, Second Report of the Committee on the Modernisation of the House of Commons, HC 190 (1997-1998). Appendix, paragraph 19. (58) D Greenberg, Laying Down the Law, (Sweet and Maxwell, 2011) 64. (59) P Morville, Ambient Findability: What we find changes who we become (O’Reilly, 2005 ) 4. (60) U Lavery, ‘The “Findability” of the Law’ (1943-1944) 27 J Am Jud Soc 25,26. (63) Cabinet Office, Guide to Making Legislation (April 2013). (64) When Laws Become Too Complex. (66) Guide to Making Legislation, paragraph 38.8. (69) ZL and VL v Secretary of State for the Home Department  EWCA Civ 25. (71) Guide to Making Legislation, paragraph 38.10. (73) Inquiry into Historical Abuse Act (Northern Ireland) 2013. (74) Dylan Hughes and Huw Davies, ‘Accessible Bilingual Legislation for Wales’ (2012) 33 SLR 103. (75) S. 1(2) 2013 Act. (76) Schedule A, Income and Corporation Taxes Act 1988. (77) < http://www.legislation.gov.uk/developer/uris> accessed on 1/8/3013. (78) House of Commons Committee Ev 14. (79) D Spence, ‘The power of doing nothing’ (2013) 7916 British Medical Journal 39.